I have been knitting and crocheting baby shoes on and off for quite some time. Today, I decided to start working on baby espadrilles, and at the same time make a YouTube video and write a free pattern. 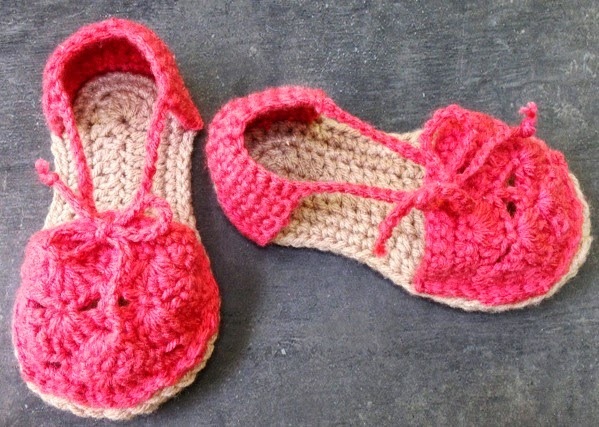 It will be a very time consuming project, but fun because I LOVE the look of crocheted espadrilles. My initial idea was to attach the connecting string from heel part to the middle of the front, but later on changed the idea into a tie, which will help these espadrilles stay on the foot better, because you can control the tension with your child's growing foot. Espadrille videos for both (right & left) handed crocheters are HERE. If you would like to subscribe to my YouTube Channel then click HERE. Huge "thank yous" to all my wonderful followers for sharing my projects. Place 2 soles with wrong side toward each other and slip stitch them together with light brown yarn (insert your hook between two stitch of both soles at the same time and pull yarn through, then insert the hook between two stitches of both soles and pull yarn through soles and the stitch - repeat all around the perimeter.) Do the same with the other pair. Weave in all the ends. Place 3 markers onto the sole. First marker should go into the middle of the sole's front, then count 14 sts to the right and place 2nd marker there, then count 14 sts to the left and place 3rd marker there. Place marker in the middle of the half circle of the crocheted top - you will align it with the middle of the sole front. Each corner of the espadrille top will be aligned with each marker on the side. Use the long tail to either slip stitch or sew the top of the espadrille to the sole. Weave in the end. Place 3 markers onto the sole. First marker should go into the middle of the sole's back, then count 9 sts to the right and place 2nd marker there, then count 9 sts to the left and place 3rd marker there. Place marker in the middle of the heel - it should align with the middle of the sole back. Each corner of the espadrille top will be aligned with each marker on the side (watch my video mentioned above, part 2 of 2).